Time to Spruce up the World? An undisclosed location. Two of three spruces ended up in the woods behind the fence. This one might be somewhere else. If asked, I can honestly say it was a conspiracy that also involved Ben. Well, there are still 10 trees lurking out there in the world, supposed to be on their way from the Arbor Day Foundation—heaven knows what I’ll do with them when I get them. In the meantime, the real reason Audrey joined the Foundation again and got her free trees is so she could purchase 50 white spruce trees at a discount for school children in Monticello. One of her classes did an environmental service project with several grades at Sacred Heart School, and each student received a spruce tree to plant. There were 47 students. Teachers also wanted a tree each, but apparently the Arbor Day Foundation was playing it safe, and the bundle of 50 must have had more than 50, since there were still three trees left over. It was cool and rainy today, and may snow tonight. We are in a transition from a warm and wonderful Thanksgiving to early winter, with highs in the 30s and lows in the 20s. It might flurry tonight. 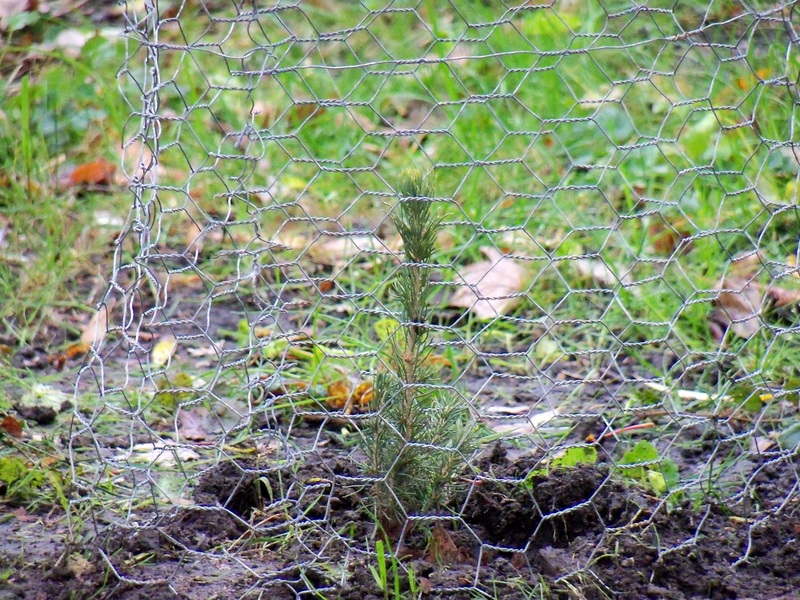 The trees are dormant, and the instructions are to plant as soon as possible, so I put the three spruce in the ground today. They are also supposed to taste good to deer, so I caged them to give them a chance. Too much to do and school is about to start for the final end-of-semester frenzy. I have oodles to work on, so it’s a good thing this is not a busy gardening time. But, I always feel better when I’ve dropped some trees in the ground—it’s such a hopeful gesture. Sleep little spruce, and when spring comes around, wake up and grow. I hope most of the kids in Monticello found a good spot for their spruce twigs, too.